In the 1900s, A.O. 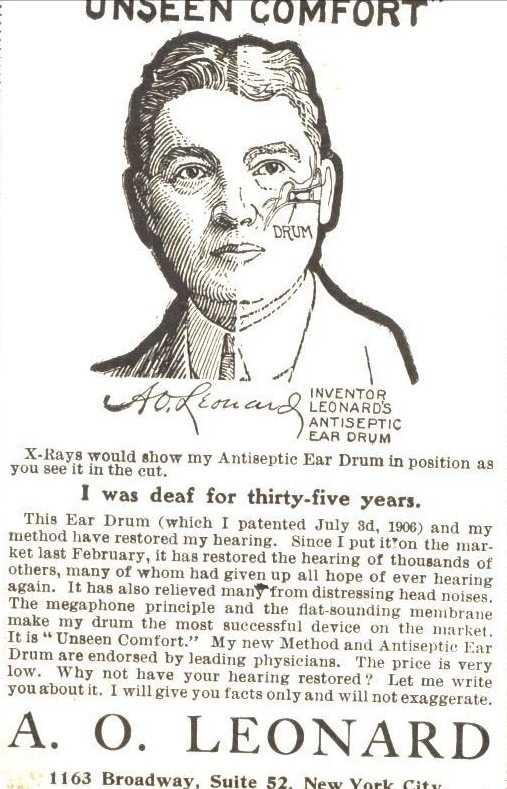 Leonard of New York City engaged in a mail-order business selling his “Invisible Antiseptic Ear Drums,” which he claimed could cure deafness. Artificial eardrums were quite popular during the turn of the century, particularly in the United States; numerous companies advertised and sold all sorts of eardrums as cures for deafness. Some of these eardrum designs were even patented. Leonard’s business relied on letters from patients expressing their fondness for his product and offering their own testimonies. The product wasn’t cheap–$5.00 for a pair and included “Leonard Ear Oil.” Additional bottles of the oil were sold at $1.00, only for those who had already purchased the eardrums. During 1917-18, Leonard began to cease his mail-order business for the eardrum, instead promoting the “Leonard ear oil” as a separate product. The oil, which boasted it could cure irremediable deafness, was sold through drug stores. The patient was advised to rub the oil at the back of the ear (rather than inside the ears), and in the nostrils. It was supposedly especially beneficial for individuals suffering from catarrh. Around the same time, the Department of Health at the City of New York obtained some of the oil and analyzed its components. The oil included: petrolatum, soft soap (ammonium oleate), oleic acid, camphor, eucalyptol, alcohol, and water. Shortly after, the Department of Health lodged a complaint against Leonard; he was then arrested and arraigned, judged guilty of making false and misleading claims. On 14 July 1918, he was sentenced to thirty days in jail or to pay a fine of $250. He paid the fine. The Department of Health additionally notified all druggists to discontinue selling or promoting “Leonard ear oil” or even the eardrums. Leonard may have ceased his business in New York, but apparently started anew in Cleveland, where once again, the Commissioner of Health of Cleveland issued an order to discontinue Leonard’s products. Apparently Leonard also had a Canadian distributor in Toronto (Martby Brothers, Ltd).